Keywords: Infantile hypertrophic pyloric stenosis, ultrasound, laparoscopic pyloromyotomy. Diagnosis of hypertrophic pyloric stenosis is made most often by ultrasound. By utilising the pre-operative ultrasound measurement of pyloric channel length and muscle thickness, we observed 0% incomplete pyloromyotomy or mucosal perforation and hence we recommend the use of ultrasound-guided parameters for laparoscopic pyloromyotomy (LP). This study aimed to assess the use of ultrasound-guided parameters for LP. We found the use of ultrasound-guided parameter for LP as an attractive and a considerable option to achieve adequacy and safety. This is a retrospective study carried out from June 2012 to June 2017 in a tertiary centre. The diagnosis of infantile hypertrophic pyloric stenosis (IHPS) was made on the basis of history of the patient, clinical examination and abdominal sonography findings (pyloric muscle thickness of >3.5 mm in premature infants and >4 mm in full-term infants and pyloric channel length of >16 mm). Infants with IHPS who have acceptable biochemical and blood gas parameters (pH, 7.4–7.5, CHCO3, 24–28 mEq/dl, serum chloride, >100 mEq/dL) were considered for operation. patients whose parents did not give consent for laparoscopy were excluded from the study. All patients were pre-operatively managed by correcting their dehydration, electrolyte imbalance and blood gas parameters to acceptable value (as mentioned above). Gentle gastric lavages were given to clear the stomach contents during their pre-operative stay. We took the help of ultrasound parameters to plan our length of pyloromyotomy and the blade of endo-knife. 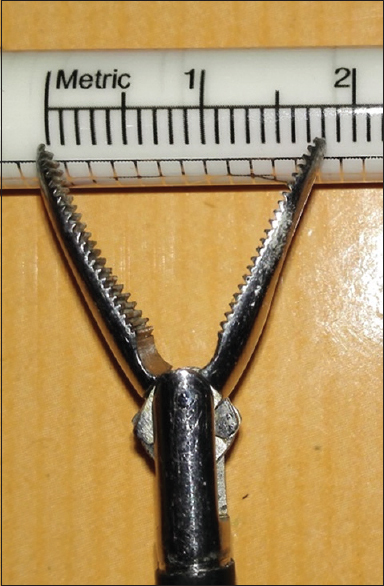 We measured the length between the open jaws of our curved Maryland forceps 1.8 cm and also of the non-insulated part of the bowel grasper 2.8 cm [Figure 1] and [Figure 2]. The procedure was carried out based on these measurements. The procedure was carried out under general anaesthesia, with 0° 5 mm laparoscope and two working 5 mm ports. One 5 mm port for 0° scope was taken at umbilicus and two working 5 mm ports were taken at the right and left mid-clavicular line in supra-umbilical position. Diagnostic laparoscopy was performed, and the findings correlated with ultrasonography report. We used the non-insulated part of the grasper to plan the length of our incision on the tumour. A bowel grasper was used to hold the duodenum distal to olive. 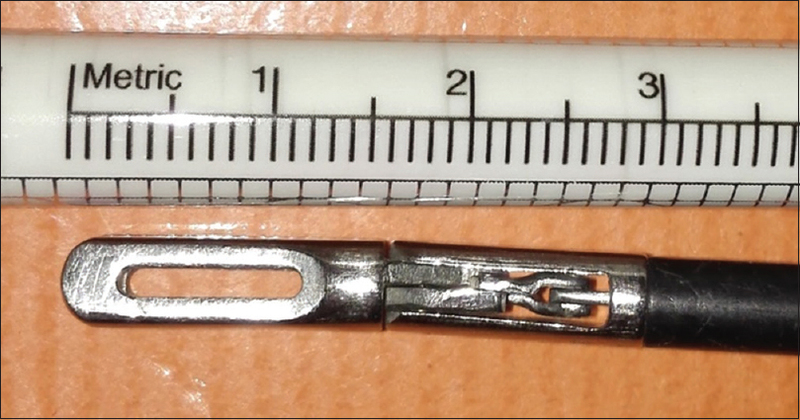 The length of the endo-knife was kept 1 mm less than the size of pyloric muscle thickness (estimated by pre-operative ultrasound) to prevent any accidental mucosal injury [Figure 3]. 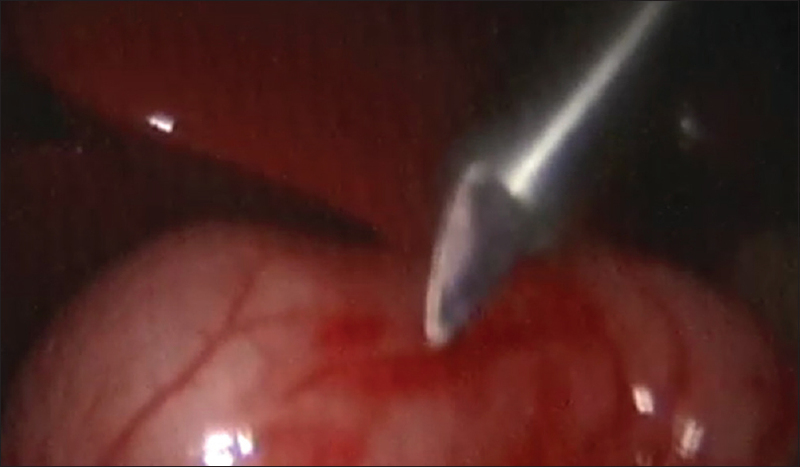 The endo-knife was inserted under vision through the left mid-clavicular line port, and pyloromyotomy incision was given as measured previously. The muscle was further split with the help of curved Maryland forceps till the mucosa pouted out [Figure 4]. Criss-cross independent movement of upper and lower lips of pylorus muscle was checked. At the end of the procedure, the length of pyloromyotomy was checked with the help of the non-insulated part of the grasper. Pyloromyotomy was considered adequate once the estimated operative length equalled or exceeded the ultrasound measurement. Mucosal integrity was checked by inflating air in the stomach. The air was introduced into the stomach through a nasogastric tube up to gastric capacity. ‘Bubbling through opened mucosa'or ‘leakage of intraluminal secretions’ are considered as markers of breach in mucosal integrity. None of them were observed in our study. The ports were then removed and port sites were closed in layers. Sixty patients of IHPS were operated in 5 years, of which 48 were operated by LP. The remaining 12 patients opted for open pyloromyotomy (OP) and were excluded from our study. Among 48 patients, 6 were female and 5 were second by birth order. Information of all the patients concerned is mentioned in [Table 1]. For the last 7 cases we operated, the average time was 25 min. In all the operations, haemorrhage was minimal. None of the patients needed re-exploration or conversion to open approach. Incidence of surgical site infection was 0%. As per our institution protocol, full enteral feeds were started after 24 h of surgery. Seven patients had few episodes of vomiting in the initial post-operative period and it was managed conservatively. Patients were discharged 24 h after tolerating full enteral feeds. Parents' satisfaction regarding cosmesis was 100%. The incidence of IHPS in Indian patients is one-third to one-fifth as compared to Caucasian where it occurs at a frequency of 3/1000 live births per year, in the US population. This disease usually presents between the 3rd and 6th weeks of life, more commonly in the caucasians, in males and typically in firstborn children. Our study showed male to female ratio of 7:1 and firstborn to second-born ratio of 8.6:1. The largest meta-analysis by Hall et al. is a review of all existing evidence including four retrospective reviews and three prospective studies in which data support the use of both approaches of pyloromyotomies. Incomplete pyloromyotomy requiring repeat operation occurred in three studies and was less common in the OP group with a probable cause of learning curve of laparoscopic technique. Mucosal perforations occurred less frequently in the OP group, although not significantly so. In four studies, there were no mucosal perforations in either group. 5% of laparoscopic procedures were converted to open procedures for completion. Among the reported indications for Conversion to open approach, mucosal perforation contributes as major one. The findings of this meta-analysis are mentioned in [Table 2] and [Table 3]. Hall et al. estimated the risk of incomplete pyloromyotomy as 0.29% in traditional ‘open’ pyloromyotomy. They found that incomplete LP results from inadequate length or insufficient separation of the divided muscle fibres, or both combined. Yagmurlu et al. found that the incidence of mucosal perforation is 1%–5% overall. It occurred more often in the open group while incomplete pyloromyotomy was found more frequently in the laparoscopic group. Today, diagnosis of hypertrophic pyloric stenosis is most often made by ultrasound. Sensitivity and specificity of ultrasound in this setting are often reported to be >85%. Ostlie et al. conducted a study to find out an effective pyloromyotomy length (found by ultrasound) in infants undergoing LP. They found that the mean length of the pyloric channel in infants with pyloric stenosis is 1.95 cm. They further suggest that completion of a LP of >2.0 cm eliminates the risk of incomplete pyloromyotomy. A study conducted by Bensard et al. is the first study to take sonological parameters into consideration to perform LP safely and adequately. They hypothesised that the risk of incomplete pyloromyotomy was reduced with intraoperative confirmation of ultrasound pyloric length. Also, they utilised the ultrasound measurement of muscle diameter for safe deployment of the arthrotomy knife blade to a depth less than the wall thickness to avoid inadvertent mucosal perforation during pyloromyotomy. In our analysis, all 48 IHPS cases underwent laparoscopic repair. The purpose of our study was to determine whether guidance of ultrasonography findings allows the surgeon to feel confident about ‘complete’ pyloromyotomy with no mucosal perforation. ‘Confirmation of completeness of pyloromyotomy by palpation’ is the added advantage of open approach over traditional laparoscopic approach. In our study, none of them suffered from mucosal perforation or incomplete pyloromyotomy. Furthermore, none of the patients needed re-exploration or conversion to open approach. By utilising the pre-operative ultrasound measurement of pyloric channel length, we decided to extend the pyloromyotomy and confirmed it with repeated measurements at the completion of the pyloromyotomy. Pyloromyotomy was considered adequate once the estimated operative length equalled or exceeded the ultrasound measurement. This step helped us perform ‘adequate and complete’ pyloromyotomy. During pyloromyotomy, mucosal perforation happens because of overzealous insertion of instrument to spread the pylorus. To avoid this, we did not try unnecessary extension onto either margin of the pyloromyotomy where perforations are most likely to occur during the spreading of the divided pylorus. Also, use of the ultrasound measurement of muscle diameter permitted the deployment of the endo-knife blade to a depth 1 mm less than the wall thickness, which avoided inadvertent mucosal perforation during the seromuscular incision. The findings of our study are summarised in [Table 4] and [Table 5]. Sharma M, Jain SK, Pathania OP, Taneja SB. The Indian experience with hypertrophic pyloric stenosis. Clin Pediatr (Phila) 1990;29:566-8. Mitchell LE, Risch N. The genetics of infantile hypertrophic pyloric stenosis. A reanalysis. Am J Dis Child 1993;147:1203-11. Puri P, Lakschmanadass G. Hypertrophic pyloric stenosis. In: Puri P, editor. Newborn Surgery. Oxford: Butterworth-Heinemann; 1996. p. 266-71. Schechter R, Torfs CP, Bateson TF. The epidemiology of infantile hypertrophic pyloric stenosis. Paediatr Perinat Epidemiol 1997;11:407-27. Carter CO, Evans KA. Inheritance of congenital pyloric stenosis. J Med Genet 1969;6:233-54. MacMahon B. The continuing enigma of pyloric stenosis of infancy: A review. Epidemiology 2006;17:195-201. Raffensperger J. Pierre Fredet and pyloromyotomy. J Pediatr Surg 2009;44:1842-5. Ramstedt C. Zur operation der angeborenen pylorus stenose. Med Klin 1912;8:1702. 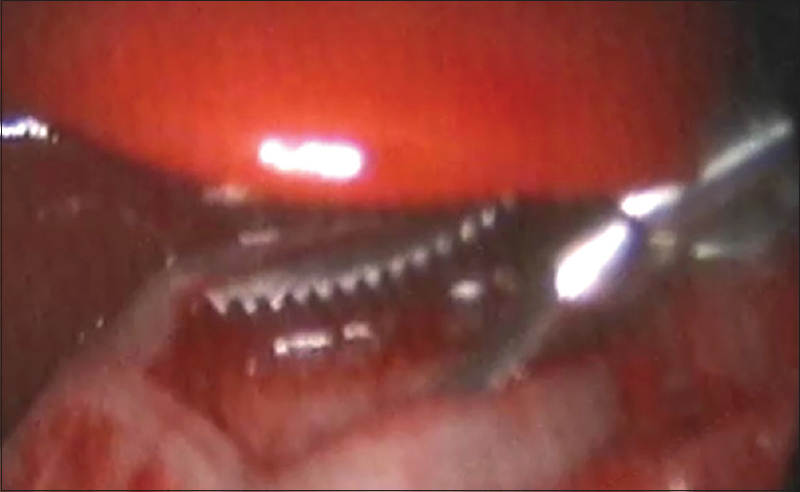 Alain JL, Grousseau D, Terrier G. Extramucosal pylorotomy by laparoscopy. J Pediatr Surg 1991;26:1191-2. Alain JL, Moulies D, Longis B, Grousseau D, Lansade A, Terrier G, et al. Pyloric stenosis in infants. New surgical approaches. Ann Pediatr (Paris) 1991;38:630-2. Hall NJ, Van Der Zee J, Tan HL, Pierro A. Meta-analysis of laparoscopic versus open pyloromyotomy. Ann Surg 2004;240:774-8. Campbell BT, McLean K, Barnhart DC, Drongowski RA, Hirschl RB. A comparison of laparoscopic and open pyloromyotomy at a teaching hospital. J Pediatr Surg 2002;37:1068-71. Fujimoto T, Lane GJ, Segawa O, Esaki S, Miyano T. Laparoscopic extramucosal pyloromyotomy versus open pyloromyotomy for infantile hypertrophic pyloric stenosis: Which is better? J Pediatr Surg 1999;34:370-2. Sitsen E, Bax NM, van der Zee DC. Is laparoscopic pyloromyotomy superior to open surgery? Surg Endosc 1998;12:813-5. Bufo AJ, Merry C, Shah R, Cyr N, Schropp KP, Lobe TE, et al. Laparoscopic pyloromyotomy: A safer technique. Pediatr Surg Int 1998;13:240-2. Ford WD, Crameri JA, Holland AJ. The learning curve for laparoscopic pyloromyotomy. J Pediatr Surg 1997;32:552-4. Greason KL, Thompson WR, Downey EC, Lo Sasso B. Laparoscopic pyloromyotomy for infantile hypertrophic pyloric stenosis: Report of 11 cases. J Pediatr Surg 1995;30:1571-4. Scorpio RJ, Tan HL, Hutson JM. Pyloromyotomy: Comparison between laparoscopic and open surgical techniques. J Laparoendosc Surg 1995;5:81-4. Greason KL, Allshouse MJ, Thompson WR. A prospective, randomized evaluation of laparoscopic versus open pyloromyotomy in the treatment of infantile hypertrophic pyloric stenosis. Pediatr Endosurg Innov Tech 1997;1:175-9. Hall NJ, Eaton S, Seims A, Leys CM, Densmore JC, Calkins CM, et al. Risk of incomplete pyloromyotomy and mucosal perforation in open and laparoscopic pyloromyotomy. J Pediatr Surg 2014;49:1083-6. Yagmurlu A, Barnhart DC, Vernon A, Georgeson KE, Harmon CM. Comparison of the incidence of complications in open and laparoscopic pyloromyotomy: A concurrent single institution series. J Pediatr Surg 2004;39:292-6. Forster N, Haddad RL, Choroomi S, Dilley AV, Pereira J. Use of ultrasound in 187 infants with suspected infantile hypertrophic pyloric stenosis. Australas Radiol 2007;51:560-3. Ostlie DJ, Woodall CE, Wade KR, Snyder CL, Gittes GK, Sharp RJ, et al. 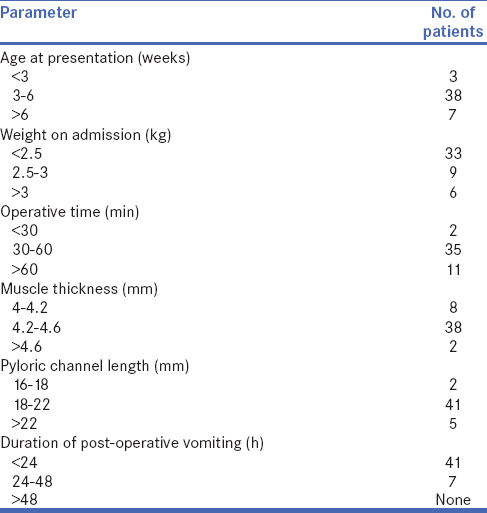 An effective pyloromyotomy length in infants undergoing laparoscopic pyloromyotomy. Surgery 2004;136:827-32. Bensard DD, Hendrickson RJ, Clark KS, Giesting KJ, Kokoska ER. Use of ultrasound measurements to direct laparoscopic pyloromyotomy in infants. JSLS 2010;14:553-7.